India is known for its wide culture and traditions. Each state has its own language, culture, tradition and custom and the style of different art forms are also quite distinct from one another. Different states have their own and unique folk dances which generally showcase the traditional or cultural richness of that particular state. It is believed that many of these folk dances were used to worship or celebrate some festival in the ancient age. So, if you happen to visit these 5 Indian states, make it a point to witness these folk dances to know more about the culture and heritage of the respective state. Assam is known for its Bihu dance which is performed mainly to celebrate the Bihu festival. It is said that love is the theme of this energetic folk dance. Both men and women perform Bihu by dancing in either parallel rows or circles with musical instruments, such as drums and pipes. While dancing, the performers wear the traditional attire of Assam that makes it even more beautiful. So, if you plan to visit Assam, make sure you enjoy this traditional folk dance. Lavani is the traditional folk dance of Maharashtra and it has been a huge part of the development of folk theatre in the state. This energetic dance form, which is performed on the beats of the dholki, usually narrates the stories of love and relationship. There are two types of Lavani namely Phadachi and Baithakichi. The Lavani dancers wear bright coloured traditional Nauvari sarees while performing. Apart from Maharashtra, this particular dance form is quite famous in Karnataka, Tamil Nadu and Madhya Pradesh as well. India has a number of folk dances, but Bhangra is one of the most popular and colourful folk dances of them all. It originates from an area in Punjab called Majha and is mainly performed during the Baisakhi festival, which is the harvest festival in Punjab. Bhangra is performed mostly by men but sometimes women also join the enthusiastic and energetic folk dance. This dance form has a lot of feet movements which are highlighted by drum beats. Rajasthan is quite famous for Ghoomar dance, which is performed by women wearing colourful lehengas. The dance derives its name from the word ghoomna which means taking circular movements. While performing Ghoomar, the dancers clap their fingers and take pirouettes with beautiful Rajasthani songs making the performance all the more colourful and vibrant. This dance form is widely performed by the Bhil tribe in Rajasthan. 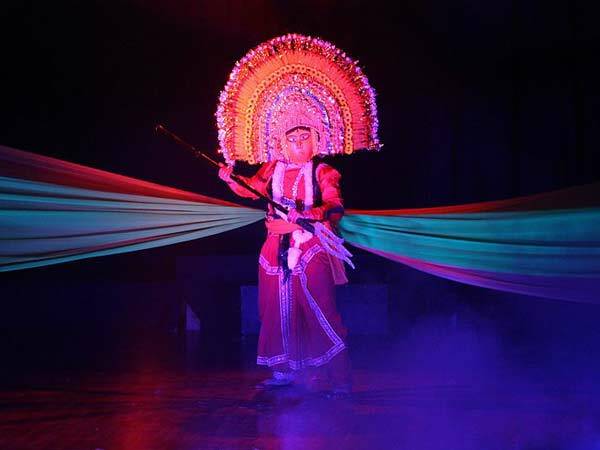 Chhau is one of the oldest and most popular dance forms in India, especially in West Bengal, Orissa and Jharkhand. This traditional folk dance is expressed through body movements and flexions. Chhau is usually performed during the Chaitra Parva, the 13-day-long spring festival. The dance style showcases domestic chore movements, martial arts and several other combat techniques. Chhau is one of the most rigorous and unique folk dances in India.